Do you remember that plucky kid with the pod racer from "Star Wars: Episode I"? 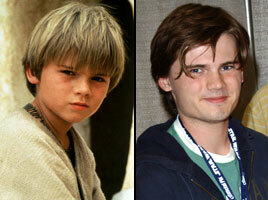 His Name is Jake Lloyd and he is now a 20-year-old lad nerd. A fat one too. Jake Lloyd wants you to know that having a major role in a George Lucas film really put a damper on things when he was growing up. OK, maybe he doesn't really deserve our pity, but think of it from his point of view. Ten years old, getting blamed for ruining the Star Wars series, mainly by the meanies in school? What did these kids know anyway! But I personally just can't believe how... uncute he has become.